JohnnyBet is a fantastic way to gain excellent betting advice from those who make gambling pay. The whole premise of the JohnnyBet portal is to connect individuals, share knowledge and make a profit in the long run. One of the ways that this is achieved is through a Tipster League. The Tipster League enables individuals to post their tips with their reasoning for their selections on the JohnnyBet website. Not only can those who are successful build up a large base of followers in quick time, but they can also benefit financially from the Tipster League, with prize money offered on a monthly basis. There are already some fantastic football tipsters active on the website, who are showing consistent, long term positive returns. Thanks to their involvement, you can find at JohnnyBet accurate football betting predictions for today. So, if you fancy yourself to have expert knowledge about a sport, or several, register and prove you worth to thousands of interested sports bettors around the world. The process is easy; simply sign up with the JohnnyBet community and start posting. The monthly prize pool is €2000, and will be divided between national leagues depending on the profit made by Top 10 tipsters. Unlike with many other tipster sites, here at JohnnyBet, we send prize money directly into tipsters’ e-wallets. No free bets with bookmakers or requirements to roll over the funds. Levsky is one of the top football betting tipsters active in the tipping league. He sometimes produces several selections a day and has excellent knowledge of all the European leagues and even further afield. With a consistently growing bankroll and impressive returns, the JohnnyBet community is very lucky to have such a talented football tipster on board. Romanian football betting tips specialist , DZovan is also another exceptional sports bettor. He also focuses mainly on football and can be found identifying value in the Asian Handicap, Overs/Unders, and 1X2 market. The 5%+ ROI that he has produced certainly beats investing your money in the bank and when following DZovan’s tips, you know that you are placing a bet which has been well researched and analyzed. Finally, another fantastic football tipster is Mephi. This shrewd Lithuanian operator strikes bets on football leagues around the world, from Brazil to Israel to India – and manages to turn a healthy profit in the process. 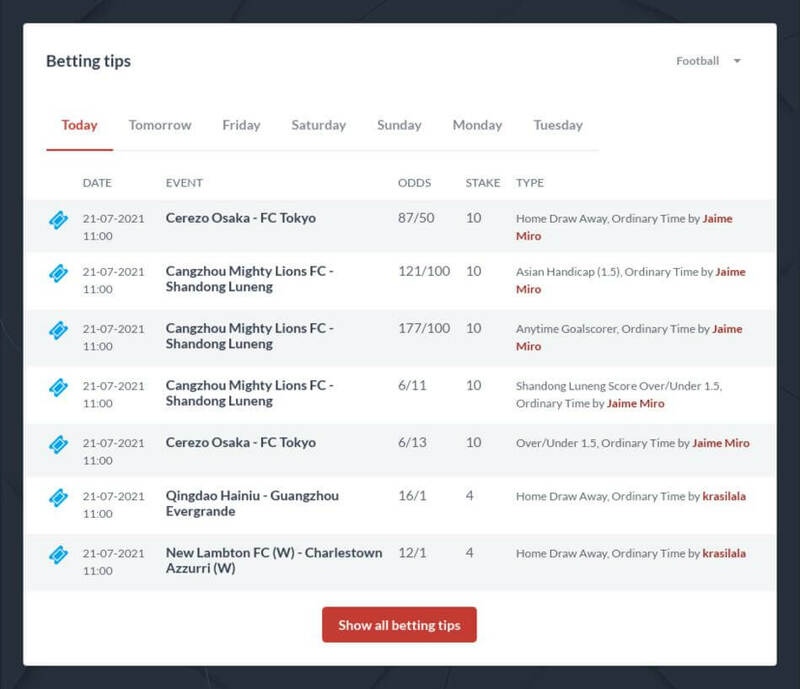 With such a depth on football betting talent at JohnnyBet, these tipsters could charge a premium for their services, but it is free for the JohnnyBet community. Betting is fun, but it is even more fun when you are competing and winning. So whether you fancy yourself as a top quality football tipster who can compete with the talent at JohnnyBet, or whether you want to simply sign up and get exposure to this valuable everyday football betting predictions for free, JohnnyBet Tips are for you . With an excellent community feel, free prize money every month and insightful betting information, the site is ever growing.